Brand manager discusses studio's first licensed game. After seeing an impressive live-demo of Mad Max running on PlayStation 4 (which you’ll hear more about in a separate article), Avalanche Studios senior producer John Fuller was kind enough to sit down with me for a quick chat at Gamescom. I’m actually a huge fan of Avalanche’s games—Just Cause 2 is still my favorite open-world sandbox game—so it was an exciting opportunity. 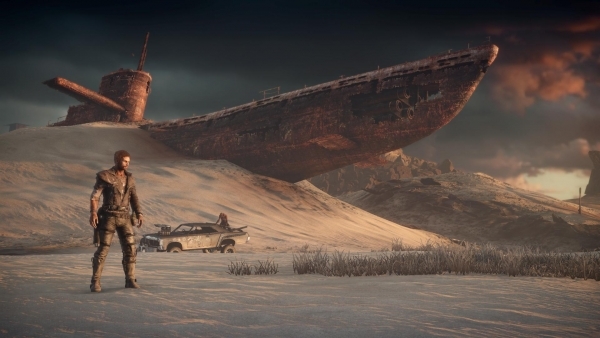 — I saw a live demo of Mad Max running on PS4, and it exceeded my expectations. So I’m pleased you were able to take a moment to talk to me, Mr. Fuller. Fuller: Yeah, we’re delighted to be here. I’m really happy that you enjoyed the demo. And we’re very proud. Obviously, Avalanche Studios, as you know, has a history [of] and a passion for huge open-world games with over-the-top action adventure. That’s why Mad Max is the perfect title for our studio and we’re proud to be working on it. And, yeah, everyone seems to be receiving it really well. — Gamescom was the first time I saw gameplay of Mad Max and I already noticed the Avalanche DNA. Before Mad Max, you were doing your own thing, original IP and all, so a licensed product is quite a change. Until now, you’ve been making games that put the gameplay first, story second. How difficult was it to switch from a gameplay focus to a balanced focus between gameplay and story? Fuller: Well, it may seem like quite a leap, quite an evolution but actually I think it’s a fairly natural development, because, first of all, Mad Max we are really treating as an original title. It’s an original story, an original game, setting up a franchise. And I think it is a game in its own right. And then in terms of a more story-driven gameplay experience, I also think that’s a fairly natural evolution. I don’t think that these two things need to compete with each other. I think for open-world games you can have a great combination of the wild, over-the-top gameplay that Avalanche is renowned for, but also a very immersive, potentially emotional experience in an open-world. It just helps to feed the motivation of exploring, trying out new stuff, finding new corners of the world to experiment with. I think the two go very well together. — I was impressed how well the game ran, from what I saw, on a pre-alpha build. Visually, the game is a wasteland, but it’s more-so “wasteland beautiful.” Could you tell us a little bit about the art direction you settled on? Fuller: Well, it was important for us. There are a number of things that play a part in deciding the art direction for the game. We definitely wanted it to be sort of threatening. It’s a menacing world, it’s unforgiving—you know, civilization has collapsed, it’s post-apocalyptic, so we wanted it to be threatening. But we didn’t want it to be—you know, it’s a wasteland so we don’t want it to get repetitive. And also, it’s an Avalanche game: we want it to be beautiful, we want you to be able to see different types of regions, different types of landscapes. We want to motivate you to explore and find your way around and have different experiences in different parts of the world. So we’ve tried to put all those together. We have some new things that you haven’t seen in previous Avalanche games, for example we have very beautiful hand crafted skies in this game and our color palette is quite [diverse]: we’re using rich colors, cool sunsets, we have our trademark weather system and time of say system so you’ll see a lot of very nice changes in atmosphere. Going from—what you saw in the demo, which is a kind of sunset/dusk style to night-time skies with hand-painted southern hemisphere stars in the night sky and then our weather system, clouds and things like that. I think you’ll recognize Avalanche in it but I think that you’ll also see a good combination of a very interesting, vibrant interpretation of a wasteland. But also it’s a threatening world, it’s Mad Max and it’s a post apocalyptic setting. —During my presentation, I noticed some new gameplay mechanics. Can you tell us about those? We were already shown the Harpoon Gun, your trademark weapon in Just Cause. Could you tell us something about the new ideas and features developed for Mad Max? Fuller: In this demo we are merely showcasing a fraction of the stuff that this game has. Even when we’re talking about regions: you saw one region of the game here, which is The Great White. It’s a seabed area, a dried out seabed with rocks. There are a number of other regions that represent a completely different type of landscape. So, on the feature side and the types of gameplay we have significantly developed on-ground combat and the melee system compared with our previous games. Our on-ground combat comprises of light and heavy attacks, parries, counters, finishing moves, special moves. That’s something we haven’t done before. You saw a sub-set of the features that are available for vehicular combat. We have the Harpoon Gun, which is a very powerful weapon for tearing down vehicles, for pulling off armor and wheels. We have the Shotgun. But there are a number of other things you’ll see in terms of upgrades and customization that give you other options for vehicular combat. Then I think this game also has more of a scavenging and looting and open world mechanic to it. It will definitely motivate you to go out and search for items that can be of value to you and can help you upgrade your character and your vehicle. Sony also announced that they have some exclusive content, the “Wasteland Scavenging Pack.” There’s gonna be lots of looting, scavenging and upgrading experiences for the open world play. — Compared to Just Cause 2, just how expansive will the open-world of Mad Max be? Fuller: Well I know you’re an expert, so you know what size Just Cause 2 was [32,768m²]. We haven’t actually defined how big this world is. You know that our proprietary technology can handle worlds of 32×32 [km] and bigger. In Just Cause 2 you could actually continue on as long as you wanted. But for every open world game, especially Mad Max, we need to look at our transport mechanisms and how quickly you can make your way from A to B and find a sweet spot that really can guarantee you fun and exploration and enough space to make you want to stay there for hour after hour, but also that it’s not to empty. It has to be the right sort of density of exciting content and we don’t want you to get bored. So, we don’t know exactly what size it’s gonna finish up with, we’re still deciding what that sweet spot is but hopefully everyone will agree that it’s a great, huge open-world with lots of exciting content packed in there. — Any final words before we wrap up? Fuller: Well, I just like to reiterate: Mad Max is a title that is a great match for Avalanche. It allows us to showcase the technology, the DNA, the passion that we have for these types of games. We think it looks really great so far, reception has been really good, and we’re looking forward to bringing it to everyone in 2014. Interviews, PC, PlayStation 3, PlayStation 4, Xbox 360, Xbox One, Avalanche Studios, Gamescom 2013, Mad Max, Warner Bros.